As I turn my attention to Christmas shopping, I have started to bemoan the cost of things. Call me the Grinch, but you don’t really get much for your money these days do you? I was thinking back to the amount of presents my Mum and Dad were able to provide me with when I was a child, and I just think that in today’s money I couldn’t replicate any of that without being in serious debt. Oh – here me lament for Christmas past! In addition to the financial aspect of Christmas, Christmas past was so much simpler then. I know, I know, I’m getting old! And I’m seeing the past through rose tinted spectacles. With that in mind, I was wondering what my Mum and Dad would have had for Christmas in the 1940s and 1950s, and that has led me to this blog. I thought I’d start my voyage through Christmas past in the forties. World War Two came to an end in 1945, but unfortunately austerity continued into the 1950s. There were shortages of a number of resources that you would ordinarily have used to create toys, because everything had been directed to the war industries. Many toys were handed down from child to child, and toys that had been made of steel previously (no plastic back then) such as Meccano and train sets, were made of tin and aluminium in the 1940s. Believe it or not, even companies who had specialised in making teddy bears before the war, had to turn their attention to making supplies such as life jackets, military uniforms and children’s clothing instead. There were some teddy bears but they were slimmer so that they didn’t use as much stuffing. In the aftermath of the war, sport and amusement were warmly welcomed. The Subbuteo Sports Games Ltd was formed in 1947 by Peter Adolphe. He revised a 1920s table football game originally known as New Footy. Subbuteo was created using flat wire, netting and card and played on an old blanket or piece of board, so it was cheap and easy to produce. Another real classic of Christmas past, still in production today is Cluedo. It was introduced in 1949 and the early sets featured a plain design, with a playing board and a separate box for the accessories. It was redesigned in 1965 and 1972. Experiments with plastics had been taking place throughout the 1930s and 1940s, resulting in revolutionary new moulding techniques that became the standard method used for all plastic production. With materials still in short supply, and families struggling financially at the beginning of the 1050s, restrictions on imports into the UK and continuing rationing, there was a fair amount of doom and gloom. However, demand for toys was increasing and while many kinds still had hand-me-downs, and played with similar toys to the ones their parents would have owned such as teddy bears, tea sets, toy guns, building kits and dolls’ houses, increasingly model kits for vehicles and planes, such as those produced by Airfix were the top sellers. Die-cast toys were hugely popular, with toys such as Matchbox series (1954) and Mettoy’s Corgi cars (1956) leading the world, thanks to their cheapness, portability and collectability. From 1957 Scalextric created waves, as the first toy to run in a groove rather than on a rail. Plastic also began to prove its worth when British Plastic Toys Ltd, experimented with new toys that were hygienic and washable, large and colourful. Meanwhile synthetic materials revolutionised the soft toy world, while lead was discouraged from use in toys for the first time. Major names from the 1950s are still among the most popular, sixty years later. Lego launched in 1955 but did not reach its peak of popularity until the 1970s, and Scrabble was imported from the US, and made available in the UK by JW Spears and Sons in 1953. In the same year, the first television sets were seen in many front rooms when the coronation of Queen Elizabeth II was televised. Here comes Muffin, Muffin the Mule! Television made superstars out of popular TV characters even then, and the first of these was Muffin the Mule who made his television debut in October 1946 creating demand for Muffin toys and novelties. Other favourites were Godzilla (1955) and The Creature from the Black Lagoon (1954), and figures and models of astronauts and space. Other popular toys in the 1950s included Pedigree dolls, slinky and the Sooty glove puppet. 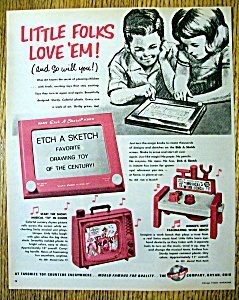 The best-selling toy of 1960 was the Etch-a-Sketch. I vaguely remember these from when I was growing up and I never understood the fascination. You couldn’t draw very well with them and you couldn’t keep your pictures. A bit pointless if you ask me, but then this was early technology! From 1961 the British Standards Institute issued new regulations that began restricting certain materials (rightly so) – these included celluloid, anything with sharp edges and toxic dyes, lead, and secure fastenings on soft toys (think of those eyes!). There was a movement among certain sections of society to consider the importance of toys as educational aids. There were calls for well thought out and professionally designed toys, that fulfilled a function when satisfying the needs of children to play. The first Toy of the Year Awards took place in 1965. Winners during the 1960s included James Bond Aston Martin car, Action Man, Spirograph (now you’re talking! ), Sindy and Hot Wheels cars. Sindy (and her US nemesis Barbie) took the world by storm and remained popular for several decades. Perhaps the biggest influence on toys of the 1960s, unsurprisingly, was science fiction and space exploration. The first man into space was Russian cosmonaut Yuri in 1961, followed by the first Moon landing, with US astronauts Neil Armstrong and Buzz Aldrin in 1969. Dr Who was launched in 1963, closely followed by Stingray and Lost in Space. 1966 saw Thunderbirds, Star Trek and The Invaders. Other new kids on the block in the 1960s included Twister, Trolls and Gonks. The 1970s was another period of recession, this time coupled with political upheaval and strikes, and a fuel shortage (oil and wood). This makes Christmas past in the 1970s very nostalgic. There were a number of major innovations in toys during the 1970s. For the first time Action Man acquired hands that could grip properly and he had hair, instead of painted hair and moveable ‘eagle eyes’ operated by a lever on the back of his head. He gradually became more jointed too. I recall my brother throwing his Action Man down the garden as a result of an ‘explosion’. Action Man’s leg broke at the jointed knee and we were gutted, until my Dad pointed out that that’s what happened to soldiers sometimes, and from then on we were proud to call him our veteran. He also doubled as a great pirate. This is the Action Man my brother had. Sorry about your leg, mate. The best loved toys of the 1970s included Lego of course, which won three awards for Toy of the Year in the 1970s, the Spacehopper (1968) and not forgetting the massive popularity of the toys and figures from Star Wars. Also launched in the 1970s were role playing games, particularly Dungeons and Dragons, and the very first video games. In 1972 Atari released Pong, a version of Ping-Pong with a white ‘ball’ that was moved back and forth across the screen by two ‘bats’ that were controlled by knobs. Pong. Look at that TV too! I am guessing that most people who read this blog will remember the 1980s at least. The most popular toy of 1980, impossible to believe it was that long ago, was the Rubik’s Cube. It cost 91 pence back then (or £4.16 in today’s money). Care Bears arrived in 1983 and cost £16.75 (£53.43 in today’s money). Who had Simon Says, or Mr Potato Head? Or what about those really awful Cabbage Patch Dolls. I’m at a loss with the 80s. All I can remember is playing endless games of Donkey Kong on my brother’s Nintendo computer. Things could only get better in the 90s – and for a while that certainly seemed to be true. Argos was the place to shop, and Woolworths were still open. Toys r Us had arrived and everyone liked going to out-of-town shopping centres because they were huge, clean and modern. The most popular toys of the 90s included: Mr Frosty who created ice lollies, and a throwback to the past, Thunderbirds Tracey Island. Buzz Lightyear was massive after Toy Story came out, and he had a laser bulb, wings and sounds! Whooo! In spite of a dirge on new Star Wars releases, Star Wars remained popular, with plenty of collectible figures and vehicles. They were directly in competition with Power Ranger merchandise. But perhaps the Christmas present of choice in the late 90s was the original Playstation. Oh the excitement! Tomb Raider and Crash Bandicoot – just heaven! Vintage Lara Croft. When she was made of squares. Slightly less expensive was the Nintendo Gameboy and the Pokémon games that put the Game Boy on the map and started a huge trend that took us into the noughties. And not forgetting the Tamagotchi. But the Christmas past character of choice for 90s for me was Sesame Street’s Elmo. Awwww. ‘Ickle Tickle Me Elmo’s laughing was guaranteed to set me off. I didn’t have one because I was too old, but oh I wanted one! Then there was Furby who was quite cute but not up to Elmo standards, and Beanie Babies, which were supposed to be collectible, but never really have been. Never mind.